The Tamisa Golf – A Peach of a Hotel – By Dario Poli | Marbella Marbella – Adelante! The charming Hotel Tamisa Golf is situated on the Camino Viejo de Coin, a road that leads up the stunning hills to Coin and beyond. It is also only a few kilometres from the popular tourist town of Fuengirola, and is placed conveniently about twenty minutes drive to Malaga airport. 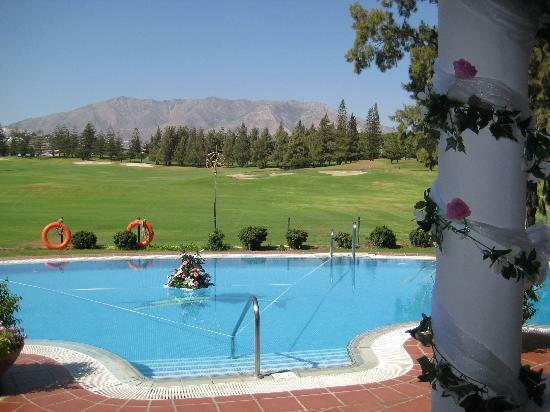 Being right next to the well-known and beautiful Mijas Golf course, the hotel with its magnificent backdrop of course and the hills beyond is perfectly situated for any guests that like variety when they come to southern Spain. I attended the first event of the hotel, as in traditional Spanish style, a party was held to celebrate the completion of the roof and if I recall correctly, we were about 40 guests that day, who drank copious amounts of vino to its future success with the German owner, his family and friends. The hotel in those days, catered for mainly up-market German clientele plus a mix of local and Golf related events and the atmosphere though delightful and charming, was inclined to be more reserved. This all changed in 2005 when the new owner from Scotland John Peach, burst onto the scene, and the Hotel Tamisa Golf then really took off in a new and exciting direction. The hotel quickly became a magnet and meeting place for various societies, charities and functions as the energetic and dedicated John Peach, introduced all sorts of innovations, to bolster and develope the business, as it was necessary to change the stuffy image of the Tamisa and attract new business as quickly as possible. In John Peach the hotel now had a real professional with much experience of the hotel industry, and with his first class marketing skills the UK Golf market quickly discovered the hotel, and the overseas Wedding Market rapidly developed, with the Tamisa now handling over 30 weddings each year, the majority of whom, take over the entire hotel for such a special occasion. Thousands of photographs were posted on websites showing the amazing backdrop from the Tamisa, coupled with the exceptional service and style that the hotel’s dedicated, professional and popular staff, lay on for such a special event. His background is interesting, for at the age of 17, the young Peach, started a five year Hotel Management Training with BTHotels in late 70’s, working in top Hotels all around UK, including Adelphi Liverpool, Charing Cross & Great Western Hotels London, Caledonian Edinburgh, Midland Manchester, plus many others, and as a 19 year old, included a one year stint in Paris as a Chef & Waiter which was quite an experience for the young Peach. He returned from London to Scotland to take up a position of hotel manager in Perth in early 80’s, before moving to Glasgow for three years as General manager of the prestigious 250 bedroom Central Hotel. In London he took up quite a challenge, in a senior management capacity, managing 25 hotels in the UK and Southern Spain, which gave him another taste of overseas life, and the desire to work abroad again. 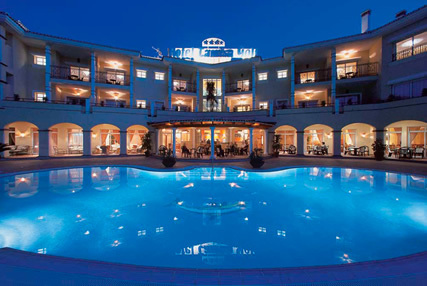 Whilst MD for Belhaven Hotels, was commuting between London & Malaga / Palma Mallorca every other week, for at that time many hotels on the Costa del Sol and Mallorca were getting into financial difficulty during the last recession of the 90’s. Having worked with many of the London Administrators over the years in his role as MD of a major hotel chain, several hotels in distress were being offered to new management teams, and he and his Spanish partner managed to secure a run down 2 star 300 bedroom hotel in Benalmadena – the Costa Azul – date was black Friday 13th August 1993, which turned out to be extremely good for them, as they set about revamping the business. John felt it was now time to go solo so in 2000 he leased a 160 bed New Build Apartotel between Benalmadena & Fuengirola, with the option to purchase during the term, and created a successful business filled with UK Golfers and Tour Operator business. But unfortunately, the Spanish proprietor had other ideas about not selling, and he vacated the premises in 2005. It still remains empty to this day. His latest venture The Tamisa, has attracted many famous guests, too many to mention, as the hotel is in a quiet location it attracts those who wish to stay away from the limelight and bright lights of Puerto Banus and Marbella. Recently, Rolf Harris stayed to make a new video, Actor, Oliver Tobias arranged a two day Press launch, Jodie Marsh spent a quiet week here, and from the world of Golf – David Livingstone of Sky Sports TV fame is one of our regulars, amongst many others. It’s an ideal and popular venue for “Photo Shoots” due to its stunning backdrop and being very media friendly, is used by many local and international TV crews for filming. Last year, BBC “Hustle”Team filmed a 15-minute Suitcase theft scam for their main UK programme. The hotel is popular gathering spot for ex pats as well as for Charity’s, local events, functions and dinner dances.